Runes of Magic is a free massively multiplayer online role-playing game (MMORPG) developed by the Taiwanese developer Runewaker Entertainment and adapted for the English and German speaking market by German company Frogster Interactive. After going through an open beta phase, the game was launched on 19 March, 2009 and Chapter II - The Elven Prophecy was launched on 15 September, 2009. The game client is free to download, and there is no monthly subscription fee, because the service is funded by real money transactions (RMT) in the Runes of Magic Item Shop. With the current version of the game (as of the date 19/02/2010) and with Wine 1.1.36 on Fedora 12 I needed to install vcrun2005sp1 instead of vcrun2005. I am lead to believe vcrun2008 would work as well. Other then this, the instructions are sound and will work. The only note is that the game *will* run a bit slower then compared to Windows but not by much from what I can see. FYI, laptop specs: Intel Core 2 Duo P9500 2.53GHz, 4GB ram, GeForce 9600M GT running the Nvidia drivers for X / KDE 4 (not the nouveau ones). Run sh winetricks vcrun2005 ie7 wininet dotnet20. Download the client files from the "Multiple File Download" section. Run the first file to start the installation process. Runes of Magic will not work with WINE 1.1.17 and lower. Performance will most likely be slower than on Windows. The Runes of Magic client will attempt to update itself after installation (in most cases) and periodically as updates are released. If the updater crashes while attempting to update exit the program and re-open it. In most cases it will continue where it left off and complete the update. Quick how to do, I insist on RIGHT MVC libs! A recent update to the item shop being web based has broken it for our fellow Linux users, and the GM's have stated that fixing it will not be of any priority, so I would not expect a fix at all. The item shop will fail to open on any WINE version. The screen will simply be black or white and will not load. This is due to the publisher (at the time of this writing, Gameforge) forcing a change to the item shop interface to make it easier for them to manage outside of Runewaker (the developer's) involvement. As of yet, the game is still playable on all current WINE versions and OS's, but the item shop is unable to be used. A good way around this is to sell your diamonds for gold, then ask a diamond seller in game to buy stuff with the gold. If you get an even trade, you should come out even. Unfortunately trading of diamonds directly is not supported. Ich habe deswegen einmal in den Anwendungs Verlauf geschaut, der erscheint, wenn ich Wine ueber die Konsole anstarte. Dort habe ich gesehen, dass der Netzwerk Puffer nicht ausreicht. Nun konnte ich den ItemShop oeffnen und Diamanten aufladen und einen ersten Einkauf taetigen. Beim Blattern ist mir der ItemShop aber irgendwann eingefroreren, ich glaube das passierte nachdem ich das Popup Menu verwendet habe. Seit dem oeffnet sich der ItemShop, aber es erscheint eine schwarze Seite. Ich versuche mir das Problem noch einmal genauer anzusehen und werde euch denn berichten. This is a very good guide. One thing to note is that you should use ie7, And do not install ie8. I was able to get it running perfectly, Including the installer in Linuxmint 17 32 bit by using this guide, And instead of disabling dbghelp.dll I set it to native then built in. I also set zlib.dll zlib1.dll d3dx9_26.dll d3dx9_30.dll d3dx9_31.dll to native then built in, Just to be sure. I did not use any registry hacks. No special setup for sound cards or anything else. You should be able to get this running in a 64 bit os the same way by creating a 32 bit wine prefix, And then installing all the software mentioned in the setup above. err:d3d:wined3d_debug_callback 0x172410: "GL_INVALID_ENUM in glTexSubImage2D(incompatible format = GL_FALSE, type = GL_FALSE)". The problem is impossibility to unpack s3tc compressed textures. If it does not work out of the box, you need to have libtxc-dxtn (providing libtxc_dxtn_s2tc.so) installed, and you need to have it installed for arch of your winearch. Google under s3tc + wine / linux / your graphics card. Most of the property graphics drivers seems to be able to unpack this s3tc somewhere in the binary driver blob, so this seems to affect only some graphics card drivers. Browsing through web, note for ubuntu users: your package may be missing some symlinks to work. So I've been racking my brain trying to solve this for almost 48 hours now on my Fedora 20 machine. the audio is VERY slightly studder-y but I can live with that. Additionally, what's weird is the music from the game comes from the fdb folder, //fdb/music.fdb and the textures come from the same folder, //fdb/texture[0-6].fdb. The music works, textures do not. While the game is playable, I'd be forced to rate it as garbage for the simple fact that without a minimap or any maps, it makes the game very difficult, if not almost impossible to play. Unhandled exception: unimplemented function urlmon.dll.CreateUri called in 32-bit code (0x7bc4dc80). Does this game still work for anyone, or do we need to change it from gold to garbage? RE: Still working for anyone? Ah... this seems to be a but with the native urlmon.dll, which apparently I had installed into the prefix either as part of the instructions above, or to work around some other issue over the years. I have individual prefixes for each game, but I've had this one installed for a looong time. I created a fresh prefix for the game, and the patcher seems to be working fine again. Unhandled exception: unimplemented function msvcp80.dll.? ?0?$ basic_ofstream@DU?$char_traits@D@std@@@std@@QAE@XZ called in 32-bit code (0x7b82c802). When I launch ROM I get "Program Error - client.exe is experiencing serious problems"
How I managed to install the game. I downloaded the hires Runes of Magic version (~9GB instead of 4.5GB). Installed ie8 vcrun2005 dotnet20sp2 d3dx9 with winetricks. The game updated for several versions. The updater crashed after every patch version (around 8 times). Had to kill it every time. The HTML pages did not show up, there came a download dialog for the page several times. Should have worked as I have installed IE8. But I did not care to fix this. When clicking the "Start" button in the launcher I first got an error "Error assembling VS". The fix was to install directx9. Then I got another error and had to download a native dnsapi.dll and put it into wine's windows/system32 directory, overriding wine's dnaspi.dll there. From there on the game started normally and I was able to create a character and enter the game. The wine version I used is 1.5.3 32bit within PlayOnLinux. I set wine to use a desktop - this is what I do for almost every game. From my point of view I would rate the game silver, as it was quite a hassle to get everything running. I have the game updated, but whenever I press Start Game, it crashes. I've placed the .dll in the Runes of Magic folder and followed the Winetricks, but nothing seems to work. Unhandled exception: page fault on write access to 0x01000061 in 32-bit code (0x00595c00). It's the same for the creation of the player, I've all the buttons but no player displayed (and some other stuff). Ops, I accidentally submitted the first post before it was complete. After you install and update the game, which is described in other places in this page, the easiest and fastest way to deal with this problem is to simply install PlayOnLinux. Install it, run it once and use "Tools > Manage Wine Versions" to add new wine version 1.3.20. After that PlayOnLinux is no longer needed. Simply replace "wine" in the application launcher/shortcut, created when you installed the game, with that path and the game should run without mouse problems. I've tried running RoM on my Mac using several different engines through wineskin, but I keep running into the same issue. It installs fine, loads fine, I can log in, but I'm unable to control the camera. I can move my caracter with wasd, but every time I try to move with the mouse or try to move the camera, it switches to an arial view and my charater runs in circles. I looked through the other posts, but nobody seems to have had my particular problem (and most people seem to be on a Linux system). Any ideas? err:d3d_surface:surface_load Not supported on scratch surfaces. Any ideas how to fix it? I have Wine 1.3.21 with winetricks ie6 wininet. I tried Wine compiled from Git, same result. Hello. Thank for your response. I forgot to wrote - yes, vcrun2005 was installed. Now, I created again clean wineprefix. I instaled winetricks vcrun2005 ie6 wininet. I run Runes of Magic installer again and install game. Game update itself (it took long time) successfully. When I run game from Launcher and login: I still have same issue with mouse cursor, It stop following my mouse for 5-10 seconds and return back. Cursor with black background around it, not following mouse movements. 1th, you have problem in ROM only? Or in all wine apps? No, just in Runes of Magic. I played League of Legends (before they update launcher), Icewind Dale 2, World of Warcraft - all without problems with cursor. I'm using Debian Testing AMD64 with GeForce GTX 460. Can you tell me how to provide info from winedump or any other tool, which can help you recognize what is going on? I think I know now when cursor back again to work. It's happening as soon I move mouse to any gather resource like herb or deposit (zinc etc). When mouse is over one of them, then cursor instantly shows back and start working again. When I left click somewhere then it dissapearing again until I find another herb or deposit. Everything can be confirmed by reading terminal, as they errors comes only when cursor is in stuck. I have wine 1.3.19 for gentoo portgage, and all work fine. I have slim client. In all tray different wine ver. 1.3.17-21, tray slim client, be careful in setting before install. P.S. : I don't have problems with mouse, I'm not sure that my answer could help. This is what I would do in this situation. I also have installed another system in my computer - Ubuntu 11.04 AMD64 with Wine 1.3.15. And mouse cursor can be seen all time. I really don't know why it didn't work on Debian. I tried Wine compiled from git (yesterday last commit), I tried Wine 1.3.20 from dev.carbon-project.org/debian/wine-unstable/, I switch with three Linux kernels (2.6.32, 2.6.38, 2.6.39), I tried Nvidia drivers 270.41.19-1, 275.09-1 (from experimental). Can anyone send me configuration files for Wine from /home/.wine catalog? I just wan't to be sure that my configuration for Wine, virtual Windows settings (registry etc.) are fine. Please zip those files (everything except game catalogues from Program Files of course:P) and send to me pioruns@gmail.com. Thanks in advance. I can confirm that Wine 1.3.21 screws up the mouse in Runes of Magic. It does the same thing for me as described by the other poster. I had been running ROM under 1.3.20 perfectly until now. Still broken as of wine-1.3.23. I'm playing with newest, compiled version on Wine from git, of course with this commit removed, and everything work perfectly. I was trying to contact author of this commit to say about that, but he wasn't interested enough even to respond me. Hi, how do you compile the current wine-git without this particular commit ? Can u explain the steps please ? join. was established 1,3,19. updated to 1,3,21. The problem really is. downgrade to 1,3,20. Everything is back to normal. There are wishing to issue a bug? I though I was alone with this problem:) I just noticed it early, because I'm using version compiled from Git. Ok, we can confirm it - it's a regression from Wine 1.3.19. Currently I compiled it to git revision wine-1.3.21-310-g7cd20a4, problem still here. I can confirm it now - I just reverted and recompiled my Wine to wine-1.3.19 (commit 7b3c1738) and it works. I can again play smoothly on Wine. Bug it between 1.3.19 and 1.3.21 - somewhere! wined3d: Switch to the software cursor when the position diverges from the hardware one. 3d229b814e614d4ed529732fc511149d6ebc87a0 wined3d: Switch to the software cursor when the position diverges from the hardware one. ...and everything (till now, 1.3.21!) after that commit, cursor in Runes of Magic broke and dissapear. Hi so i followed the set up process and i get the game all the way patched up then i open game, starts up then it takes forever to get background loaded screen stays black for maybe 10 15 secs and after that its running fine but i cant login because the login screen isn't appearing any ideas? Hi I have a problem with the game, the game turns up to log into the server then the whole system stops. I have heard that this may be a fault of drivers. Sometimes the game turns on properly. But often stops at the login screen. I would like to know if anyone has the same problem as me with drivers from AMD. Perhaps this is due to something else. Anyone else having mouse problems? I managed to get as far as the patcher once, but that was after the install when I chose launch runes of magic. This could be related to me updating my nvidia drivers after the install but I got a much bigger error message before that. Runes of Magic menus like EULA or login doesn't appear on some graphic cards. crash when pressing "start game"
maybe someone here can help me, no matter what i do i always get an error message when pressing start game. i have installed winetricks along with ie6 and vcrun and all that, tried downloading the dll and placing it in the rom folder, nothing works. I am unsure why this has a 'Gold' Rating instead of Platinum. Playing on both Ubuntu/Mint and Windows 7 and windows vista, both work exactly the same. It actually seems like Windows 7 crashes more than Ubuntu running the latest version of WINE. I will be submitting a few application test results later. both seem to crash on loading a new zone or just normal play, but it's usually when teleporting or entering an instance. Can't confirm: It runs fine on two Win systems (XP and 7) here with no crashing. My son plays it all the time on XP and I've played for hours on 7 and have not seen the symptoms you describe. It's much buggier under Wine: random crashes during fight, and invisible player characters if you crank the graphic settings. Crashes less if you zoom all the way in to first-person mode. sinister@BlackBeauty ~/.wine/drive_c/Program Files/Runes of Magic $ fixme:win:EnumDisplayDevicesW ((null),0,0x33a4dc,0x00000000), stub! fixme:ras:RasEnumConnectionsA RAS support is not implemented! Configure program to use LAN connection/winsock instead! Im not sure whats going on, but every time I try to run the game, this happens. Im not sure if its running in the background because of the line "Connection: keep-alive" but the space on the screen where the update window was is frozen. Except I have both those files in my RoM directory. Followed the installation to install ROM. Worked great and can sign in and play but often it will get a client critical error and then I have to restart the game. Any idea? Try placing dnsapi.dll and install the required winetricks packages (in installation notes), this lowered the frequency of errors on another machine of mine. There are no X11 drivers for Macs... it simply has a passthrough to use the native quartz display... do not worry about graphics drivers at all, just keep it updated through Apple software Update. Macs do not use X11 for windowing. Wineskin has a built in X server that runs when you launch a wrapper. If you get Wine errors saying the X server was not available, then there is a problem with the X server ending too soon, or crashing. Normally in Wineskin the X server only shuts down if the wineserver that was started in the wrapper shuts down. If you want to use winecfg virtual desktop setting, set WineskinSettings Screen Options to Rootless (windowed) with normal windows... if you set a virtual desktop in Screen Options it should override anything you set in winecfg, but it will auto resize as programs try to adjust resolutions. I couldn't read any more because of this forum, but you might want to ask me directly (portingteam.com forums in the Wineskin section, or the Contact Form on wineskin.doh123.com) if you need Wineskin specific help. While default engines for Wineskin use standard Wine builds, there are still specific differences in using the software. I have spent my time attempting to Install Runes of Magic on several distributions and Wine versions. I wanted to create a methodical post covering the average of what has been common in all installations so far. Here is a list on what I've found to be used as a reference. Time will prove my information to be "false" as new updates will make this obsolete. 1) Please make sure you have at least Wine 1.2.x. I am stating this because so far I've have found more stable results with in-game performance. Runes of Magic is a game from 2009 and thus requires as much optimization as possible. 2) Winetricks ^_^ You will need vcrun2005, ie6 and wininet. 3) In a lot of versions I failed going from the launcher to the login screen. Search the internet and download dnsapi.dll This solved the problem with launching the game. Download this file and place it in your main game directory (the one that has the all the executables. 5) For those who own Top of the Line Nvidia cards. nvidia-settings set to Adaptive will only give you Performance Level 1 in-game. You will need to set your video card for Maximum Performance. RoM will drain you. Control + X = The command that shows your ping and framerate. On Windows, I find the framerate to be higher, but the ping is also higher as well. On Linux I find the average ping to be lower than on Windows. Afterall Linux was made for networking and serving files. If you find that raising all settings to maximum or minimum result in the very same performance as far as framerate goes and you are overclocked like I am with quad cores..It is actually the video card downclocked holding you back. I did not find any problems in the game so far. However, I did find some quirkiness. This is isolated as I have played a lot with the Wine Registry due to optimizing other games. The order of Installation should be your video drivers first, Wine, Winetricks and everything mentioned. Update the game itself and then put the dnsapi.dll in the main game directory. Run the game.. Note: If you get a white splashscreen and a crash message...Winetricks to install all three again with dnsapi in the directory. It tends to solve things. Can you tell us where you downloaded your dnsapi.dll file? I found one online here: www.dll-files.com/dllindex/dll-files.shtml?dnsapi, but I'm not sure if I got the right thing, because now my Runes of Magic Wrapper won't even load up the launch screen. When I take the file out, the launch screen loads, but I can't get past the client updater. I believe I have the rest of the wrapper built correctly, using Wineskin 1.2, engine WS4Wine1.3.5, and the three winetricks listed in your post. But I must be missing something. Can you post your wrapper specks? Or post one for download? Afterwards my Launcher kept failing. I then downloaded from the same link you posted...my dnsapi.dll file. I took the file and put it in the Runes of Magic Directory where the Runes of Magic.EXE is located. So far, so good right? Another problem then occured...I launched the game AFTER UPDATING IT and found the Launcher (the one that has the Start button and region selection before you enter the gamelogin screen displayed in White, almost like it was stalled by something. What I did was Reinstalled from the Command Line the three winetricks (vcrun2005, ie6 and wininet..and afterwards the game actually launched and worked. What I am currently using in my WINE installation for most of the games I play are vcrun2005, ie6, wininet and direct x 9. 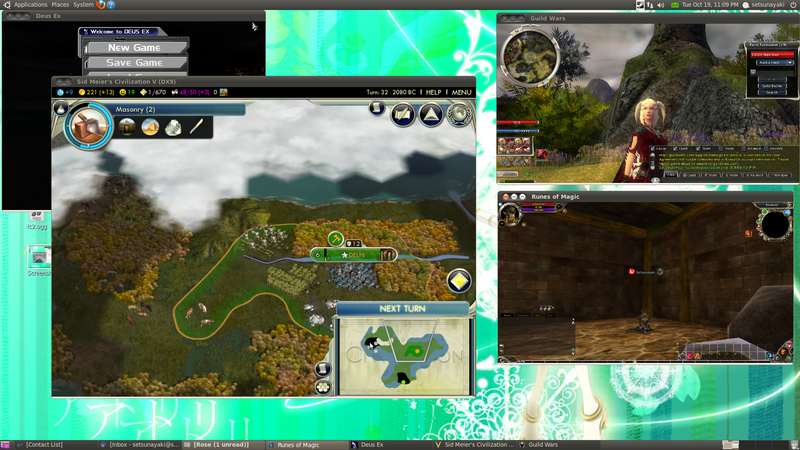 Here is a screenshot of running four games in their windows, Runes of Magic being one of them. Note: command 'wine vcredist_x86.exe' returned status 199. Aborting. You probably shouldn't be using this, It's VERY invasive. Note: command 'wine /Users/adminuser/.winetrickscache/directx_feb2010_redist.exe /t:c:\winetrickstmp' returned status 199. Aborting. 'winetricks d3dx9' loaded just fine, so I tried installing vcrun2005 again, only to receive the same error message. Any ideas on how to fix this "$DISPLAY" problem? Thanks for the screenshots, too. They give me hope! lol. $Display problems occur if a driver is not working correctly or if there is something missing...Like the people who try to get a game working by not installing it and just running it by right clicking on the exe and running it in the Desktop Interface and it looks for a resolution the monitor does not support. What are your system specifications? I am sitting here wondering what is truly going on at your end. Are you also using Ubuntu 64 bit and similar hardware? I should mention I ran everything from the 2D Desktop Environment Gnome. I am running Mac OSX Snow Leopard, 10.6.4, on a MacBook Pro 2.2 GHz Intel Core 2 Duo. 2 GB RAM. My graphics cards is the Nvidia GeForce 8600M GT with 128 MB VRAM. Your suggestion about not actually installing the program may have some weight. I got the setup.exe and setup folders by running the single installer file from the Runes of Magic page with a trial version of Crossover Games. Perhaps I should go back and download each file independently just to make sure I have everything. Then I can rebuild the Wrapper with .dll file in place. Thanks for staying with me on this. Download all the files from the site including the setup.exe so you have the files locally on your machine to install. Make sure you get an MD5 checksum of the files, since the game is as large as an Operating System. Information about your OS and video card. While Linux favors Nvidia cards while ATI cards have lower performance on average, Mac OS X favors more ATI cards, unless you are going workstation for Nvidia. 0) Download current drivers for Nvidia Cards. Most people use drivers 195. * or over...At least run with 195. * as that one shows success. 2) Rune the installer of the game through a console using the wine (gameinstaller.exe) format. 4) Use Winetricks and put in directx9 (d3d9c i think), vcrun2005, ie6, wininet. 5) Set a wine window at 1024 x 800 through winecfg. 6) Please run the game to autopatch. Wait until the game is fully patched. 7) Download and dump in dnsapi.dll into the main Runes of Magic Folder. create a folder named Direct 3D (should appear on the left side of screen and highlight in. 8) Launch the game through Launcher.exe and press "Start Game", you can also try Runes of Magic.exe but I run it from the launcher...like most MMORPGs go through a launcher that activates the game's main EXE. If ---> The launcher screen is all white, then quit out of there and apply all the winetricks again...The game should run. Your video card, the 8600M is capable of OpenGL 2.1. Mine is capable of OpenGL 4.1 and above...There is a wide gap there...between our OSes, drivers and technologies.. I am hoping this works for you, specially the regedit tweaks because opengl becomes important for many games. Once I am done helping you get your game working, I will write a clearer report and conclude my testing. :) I feel I need to rewrite this report. 0) Downloaded Nvidia driver 195.55 and ran it with Wine 1.2. Setup claimed there was no hardware suitable for the driver and shut down. I am not sure how to incorporate the driver in the runes of magic wrapper under Wineskin, or if that's what you really meant. Everything else is done through Wineskin. 5) I had to select the "Emulate a Virtual Desktop" option under winecfg in order to set the window size to 1024 x 800. I did this. Is this right? 6) I let the game patch. 7) Placed dnsapi.dll file. When I opened the Wine Regedit (through Wineskin control panel) a Direct 3D folder already existed, but it was empty. So I created the Strings exactly as you wrote them out, and as individual strings. 8) I lanched through Launcher.exe. The launcher appears inside a black window. The launcher screen is white with a file download warning. It wants to download an .html file, but is asking if I want to open it, save it or run it. I select Open because I believe it is trying to load information from the Runes of Magic website that is constantly updated. It returns with a DDE error, the window closes, and the launcher remains white. Something that did make a big difference was loading the winetricks BEFORE installing the game. I picked that up from Paulthetall.com, on one of his instructional videos for Fallout 3. Just doing that got me all the way through patching and to the launcher screen. Another note is that the launcher window loads just fine if I run runes_of_magic.exe through Wine 1.2. When I hit Play, the screen goes to fullscreen, white, there's music, and the cursor changes, but nothing else. Don;t know how much that helps, but it did make me wanna ask, what engine did you use in your wrapper? I am using WS4Wine1.3.5. What people try in WINE are their optimizations in RegEdit to get the game under control to display correctly. Some try higher version numbers. The reason I believe I am having success is because a lot of what Linux uses is OpenGL to cover the slack of using D3D. My card is capable of running OpenGL 4.1 which means I can use anything added into Wine on the OpenGL side of things. Did I forget to mention that Apple likes to modify and optimize OpenGL that they run on their platform which sometimes causes conflicts between Khronos Foundation specification for OpenGL? But you have achieved a step in the right direction. I am glad I am headed in the right direction! Any ideas about the DDE error? I did notice that in my Drivers folder, located in the same Wine folder as the Direct3D folder in RegEdit, I have an audio driver installed (coreaudio), but nothing for video. How would I go about installing a driver within this wrapper? When i asked about engines, I was referring to which Wineskin Engine you were using. But perhaps you are not using Wineskin at all. Are you working in Wine directly? If so, why do you work in Wine instead of using Wineskin, or something equivalent? These questions probably belong in a different forum. Perhaps you could email me directly, or answer in another forum here. Thanks again for all your help so far. I have learned a lot from your instructions! You will have to find a way to really get OpenGL to work through it....A lot of Wine Software relies on it. You did get far. I work in Wine itself, not Wineskin. Regardless the Engine, Wineskin or Wineprefix/Wineversion at the very end of the day one needs either Direct X or OpenGL. Windows based OSes are heavily built around Direct X, but OpenGL is used in the professional graphics market and has many advantages to Direct3D, but its demands are a lot higher and using its API is more complex. The first rule of thumb to any gamer on any platform is allowing a fully compliant video card driver which has full support for OpenGL or Direct3D. Practically every non-windows platform goes the OpenGL route. If you can't get a wrapper to work on video (which winecfg - graphics) has things, or DirectDrawRenderer - opengl (or the others), no game will run stable on it without more software rendering being involved which really eats up your resources. I did try to help but I did not understand enough about mac os x wine. I tend to not deal with macs for many reasons that are beyond the scope of our exchange. I installed and updated Runes Of Magic without any problems but when I run the game music starts to play and my mouse pointer changes but it doesn't look like it takes me to the login screen like I've seen on youtube videos instead I go to a screen with a archer and idk what els something els is infront of him and there is wind that blows between the archer and the other thing I've seen peoples vids on youtube loging in I've never seen it on theirs maybe its a opening video that gets stuck has anyone els had this problem? Just a "little" bunch of people. If you looked at the bugs listed for this entry, you would've seen bug #17818 , which plagues every ATI Radeon user and some old Nvidia users. My bad I do have a ATI card but I'm not sure its Radeon or not but if it is the card then I guess I will find something els to play thanks. Anyone else notice that a lot of players appear to be invisible when playing this under Wine? It's kind of funny to see mounts running around riderless. Just tried the latest git and nvidia binary drivers. PC's are still invisible, NPCs appear fine. managed to get around this by playing around in the graphics settings. I'm not sure which setting caused them to be invisible though. I have the weirdest connexion failure with Runes of Magic. I've been playing it for several months without any major issue, but for the last few weeks, i can't connect my main character. When i click "Enter", the loading screen shows up, and sends me back to the login screen after a couple of seconds. This problem only happens with my main character, not the others. This problem happens even with a new wine prefix, even with a new fresh RoM install. However, the problem does not happen on another computer on Windows. The terminal shows no error, only a few fixme that happen with my other characters as well. Can anyone help me find out which debug to active to get more information ? WINDEBUG=+relay just takes far too long to load the game. Oh, and if anyone encountered the same problem, i'd be glad to hear more. Been a while since I tested with this one, so I tried it again today. Created a new character, played for a couple of hours. I quit testing after the 5th random crash (which at least nicely asked if I wanted to send a bug report to the game developers). There were also a lot of graphical glitches that appear randomly throughout the game. Basically the graphics look great at first, then seem to get more and more corrupted as you change zones. I saw tons of headless people, other people that were only heads, and completely invisible bear cubs. This could, of course, be due to the 256.53 Nvidia drivers. I'd be interested to hear the results of others using the same. At any rate, I'm reluctant to score this anywhere near gold. If someone else doesn't submit a new review, I will probably do so next weekend after Ubuntu 10.10 is officially released. I have just a little problem. Every time i move the mouse to one side of the screen ROM lose the mouse focus. That is not a big problem but when you what to turn around your character you always have to turn your mouse back to screen. Other wine apps work without any problem. Any sollutions? Game crash when clicking "Start Game"
The game installed correctly, I got it to patch, and now the patcher is right. When I click Start Game, this is what my terminal tells me, and nothing happens. I installed vcrun2005, ie6 and wininet. It solved the error message problem. However I can't seem to start the game. Any ideas? Turns out I was missing DNSAPI.dll. When I added it into the game directory it worked fine. ROM installed beautifully... runs great, too--however, I DO have this weird issue (ALL throughout the game, in fact) where my mouse clicks don't register. I'm new to Linux as a whole, so I confess it may be something I failed to do--but it ONLY does this on ROM. Try version 1.1.32 -or- you may want to consider using wasd movement instead of click movement. The game installed fine. However when I launch launcher.exe it opens the launcher and only renders the upper left part of it. I can't see the entire thing, and it only seems to update 1/10 tries I even hit it. I have installed according to the list here. Updating my Wine version solved this issue. hy everyone.after having alot of issues with making this game work iv finally done it.the game works with no bugs at highest settings.used linux mint 9 x64 my pc is a core2duo e7200 2.53ghz 4gb of ram running in dual channel and a nvidia geforce 9500gt video card with the latest drivers from nvidia.what i did to make it run after a failed try i unninstaled everything.wine,the game and everything that had to do with these.after that reinstalled wine 1.2 and installed vcrun2005,ie6 and wininet through winetricks.installed the game left it patch and just clicked start.works like a charm.if anyone wants some screenshots feel free to ask.maybe il do a video too soon with a how to:).btw im playing the european version. Got it to install and update after some holdups. When I launch it with "start game," however, it remains stuck at a lovely but useless yellowish 3D view of a woman aiming an arrow at something. Is this the background behind the login screen? I don't remember. Anyway, that's where I'm stuck. same here with an ATI Radeon HD 4850 on MacOS X. It runs fine on Windows too. Seems we all have the same issue, ATI users. The problem that you are experiencing is because of your ATI drivers.Alot of ppl using an ATI video card have the same problems.The solution for you is either wait for a new driver or get an nvidia graphics card. ROM auto-updated to Chapter III today and although the update went smoothly, I am having problems logging in. The game often freezes up at the character selection screen. When it doesn't freeze, the "Send Error Report" box pops up and I am able to successfully log in and play the game with no problems. This problem was fixed a few patches ago, but has returned with Chapter III patch. Is anybody else experiencing this? Has anybody found a work-around? I'm mystified with folks that say their ROM works in wine > .37; what's their secret; I use PlayOnLinux to launch ROM; ran it in debug mode to capture the freeze this am and it came right on up with no freeze?!?! The freeze seems to be random. Usually I'll have to attempt a log-in about 4 times before I can get past the character selection screen. How do you use debug mode? Solved for me! I switched wine version from 1.1.33 to 1.1.37. Game instal with no problem - just go step-by-step with instal notes. Update also works but when I go into game, enter login and password, choose serwer I can't click "accept" - button is unactive. Any ideas ? Maybe that fix it. I don´t have tested it. I will wait that wine have fixed it. Won't install from the automatic downloader. It does successfully install if you download the ROMSetup.exe and all the bin files manually. At that point it will not get past the ClientUpdate Screen. Fresh install of Lucid 10.04 and wine 1.1.40. How they it can be still listed as platinum after 3 broken releases is a mystery. Definitely rated as Garbage at this point as it's unplayable. Wine 1.1.37 is the last version so far where the game works. It suffered a regression on 1.1.38 and in 1.1.40 hasn't been repaired yet. If you have the game installed, you'll be able to start the launcher, but when you hit either the "Start Game" or the "Quit" buttons, the program clientupdate.exe crashes and sometimes it doesn't even close the app correctly (needs a console "kill -15" command). Hope this regression is repaired in the next version, since this is a very good FREE mmorpg. The same here, wine 1.1.37 was the last working version with ROM. I hope they fix it in the next version. fogdownload-rom.exe crashes almost every time i started it, but when it has started, it crashes after couple mins. "err:secur32:SECUR32_initSchannelSP libgnutls not found, SSL connections will fail"
I've notice that to successfully launch RoM I have to configure it in 640*480 esle it won't launch. Bye, and again excuse me for my English. I'm getting launcher window in white. I can play without major problem cause I can see bottom buttons but rest of window is in white. Is this normal? Client window not showing correctly. Pressing Start Game, there is a page fault in clientupdate.exe. The same pressing Exit button. Back to 1.1.37, ROM working again. Yeah, I just tried it and see it too with the latest SVN. I doubt I'll get any time to look into it until next week... but if no one beats me to it I'll take a shot at fixing it. shdocvw: Moved WebBrowser client site realizing to separated function and release more interfaces in SetClientSite. Reverting it fixes the crash. Just now took a quick glance. I'm not familiar with shdocvw, and the change comment is sparse, so it will take me time to get up to speed and understand if all all the changes I see are intentional. For instance: WebBrowser_OleObject_Destroy is now calling release_dochost_client(&This->doc_host) first thing (without checking to see if it's null), when it wasn't before. WebBrowser_OleObject_Destroy only gets called right after a call to DocHost_Release(&This->doc_host) which itself already calls release_dochost_client(This). If that's not (a/the) problem, it is at least redundant and confusing. Yeap, I can confirm this. Yesterday I updated to 1.1.38 and when I tried to run the game again, it crashed after pressing the "Start Game" button (it crashes in the ClientUpdate.exe file). So, I've got ROM working install wise, but to run it, I need to reduce the graphics settings, as my computer is just barely over the min reqs. How can I access the settings/ configuration from the launcher (not ingame)? I know there's a button, but its greyed out so I cant click it. Hi, problems again executing ROM. ROM have been working in previous versions without a hitch. Hi, solved uninstalling and reinstalling nvidia propietary drivers. I upgraded my version of wine to 1.1.36, and now runes of magic will not load. I'm running arch linux on a quad core phenom x4 system. I've posted the output to pastebin. The errors start towards the bottom. Anyone else having this problem with this version of wine? ha! had the exact same problem, solved it. "Runes of Magic.exe" instead of "launcher.exe". fixme:actctx:parse_manifest_buffer failed to parse manifest L"C:\\Program Files\\Runes of Magic\\Microsoft.VC80.CRT\\Microsoft.VC80.CRT.manifest"
err:module:LdrInitializeThunk Main exe initialization for L"C:\\Program Files\\Runes of Magic\\Client.exe" failed, status c0000135"
hm... but the problem resides with vcrun2005 for sure (MSVCR80.DLL is vcrun2005) ... so you probably have to fiddle a littlebit with installing, removing, overriding this. There also should be a msvcr80 folder in the runes of magic folder, maybe take a look at this as well. or maybe make a backup of the vc80.crt folder in runes of magic and then delete it, maybe the updater will replace it with a correct manifest... hmmmm... well... maybe someone else has an idea? where is that vcrun2005sp1 installing to? I deleted the folder (after backing it up) and reinstalled the vcrun2005 package with winetricks and I don't see that folder in the ROM folder; where does it go to? .36 (or somewhere thereabouts) seems to have broken it for me too. I can't get past the character select screen. Too tired to troubleshoot tonight, will look at it this weekend. On wine-1.1.35 I installed vcrun005 and now I can see the login screen without the agreement window. The mouse cursor is ok, sound works. I cannot click anywhere. I noticed directx9 has not been installed in my wine install process and this could explain that. So I tried but had a fail message. 01/08/10 08:25:29: dsetup32: IsWow64(): Windows 2000 or Windows 9x. 01/08/10 08:25:29: dsetup32: GetFileVersionInfoBlock(): Unable to get FileVersionInfoSize, file: C:\windows\system32\user.exe, reason: 2. 01/08/10 08:25:33: dsetup32: DXSetupCommand = 0. 01/08/10 08:25:33: dsetup32: IsWow64(): Windows 2000 or Windows 9x. 01/08/10 08:25:33: dsetup32: GetFileVersionInfoBlock(): Unable to get FileVersionInfoSize, file: C:\windows\system32\user.exe, reason: 2.
no problem. Thanks for the link. I followed some steps inside since it's very similar to MacOS X.
I get a "download version.txt fail" error when I try to start up the game. Any help please? First of all, I have to confirm the "Terms of Service" every time I start the game. I haven't played this on windows so I don't know if the user needs to confirm this every login. Next, I keep getting an "Account or Password error" message. I can't login to the game but I can login to the website through my native browser. Does anybody have any suggestions? Thanks in advance. Having to confirm terms of service is something the game always done on windows as well. As for the login part..hmm. I used to be able to play fine, but I can confirm the same behavior you're seeing now. The ini keeps getting reset to the EU servers unless you mark it read-only. Even sticking it to read-only, I get the "Account or password Error" message when I try to log in - though I can log into the web site and have even tried resetting my password. Figured it out - The actual region that gets used is the one in the Launcher - and somehow it got reset to EU. Even if you change the file, it will prefer the region picked in the launcher. After changing it in the launcher, I was able to log in again. As far as I've seen it, you can create one account for each region, but the game will work with one acc only. For example, if you create an acc in the homepage for EU, and you install the game, when you want to play, you MUST use the EU servers, or else your pass will fail (since you don't have an acc in the other servers). On windows you have to click on the "Agree to Terms of Service" als well everytime you start the game, so this is not related to wine. If you could help I would appreciate it, I played the beta of RoM and I was delighted, but at that time was using winxp, but now only use Linux, delete the winxp on my PC. did anybody get this to work under Mac OSX Leopard with Winebottler? For me the client update always crashes so I cannot run the game at all. I seem to be having a similar issue to the graphics bug where you can only see hills n such. However I see nothing but a blank black screen. I can hear the ambient music and the cursor changes to the game cursor however the screen remains black. 2.1.5.2004 Dosen't load at all. Last night it patched to 2.1.5.2004 for me,(haven't played in a few days) and since then nothing happens the game simply doesn't load... not even the client updater. I've uninstalled wine. unistalled the game, and reinstalled everything from scratch and nothing. I click the desktop link and it starts and then stops without a crash log. I go to menu and select any of the .exes and the same thing..
RE: 2.1.5.2004 Dosen't load at all. ok after two reboots and reinstalling VC again, I've got the launcher to load if I click the direct .exe but it won't launch the client. And if you try directly it just does nothing. I installed and patched the game perfectly and when I run it it says. This program has encountered a critical error. Send or Cancel. Any help? Fixed that but there is a new problem. I got a patch this morning and now I can get in the launcher but when I press start it closes and te game dosent come up. Did the patch do this? Try going into winecfg, to the libraries tab and changing dnsapi from native to builtin. This solved this issue for me. Fixed it :) Its running fine now but Im getting bad performance (I have a good video card) Any ideas on general performance boosts? i have the same problem (error encountered: send/cancel) with a complete crash, you said you fixed it, could you please tell me how? Had the same problem, after Update of Wine to V 1.1.34, RoM stopped working. However, after today's update to Wine 1.1.36, RoM works again. I installed RoM via wine 1.1.33 but it won't work. I've tried to install it using PlayOnLinux too, but it didn't help. but it still won't work. R6034 An application has made an attempt to load the C runtime library incorrectly. fixme:actctx:parse_manifest_buffer failed to parse manifest L"Z:x\\Microsoft.VC80.CRT\\Microsoft.VC80.CRT.manifest"
Seems to be an error with "Microsoft.VC80.CRT.manifest" and "MSVCR80.dll" eh? What do I need to do to get this game working? I think the new version of ROM needs Visual C++ 2008 redistributable. You also made sure to download the individual install files instead of the single file installer? Okay so as a last resort I tried to reinstall Wine which worked, so it was probably something wrong with some files in my Wine. 1.1.34 installed, Runes of Magic stopped working. I just updated to Wine 1.1.34 and the game crashes when I click on "start game" with an error message. After downgrading to 1.1.33 it runs fine again. if you guys have a problem with starting the client or crashes while updating you should download "vcfile.res" (search the web) and put it into your Runes of Magic installation folder. I don't believe this is the same issue as reported in the bug because I can actually see the EULA. However, it does not let me scroll the EULA or click either button on it. I attempted to follow the suggestions in the bug with no help (in fact, one of them brought up an error and wouldn't even load as far). I get *some* of the background, it looks like hills, the rest is black, with the EULA showing up in front of it. The mouse has the graphic that it is supposed to. Moving a window over it leaves a trail of that window, but after a few minutes the EULA screen will refresh and give the original part again. Music plays in the background. The game seems to work, but at probably not with my graphics card? i play multiple characters and like to return to character select but when i do it closes down :( please help how do i fix this? i have geforce 8600gt graphic card and i used wine version 1.1.31 + winetricks. i only installed directx9 and fonts. At first i got the same problem with the eula-screen. any fonts, VC++ Runtime 6, VC++ Runtime 2005 and VC++ Runtime 2008. Rom runs but bay graphic and gameplay! the game runs and with the winsock.dll there are no problems to launch the serverlist etc! ubuntu 9.04 mit wine 1.1.30 auf amd athlon64 x2 2.6ghz mit gforce 9800gt pcie! I can also start the game, and when I'm on the first screen, to create a player, it crashes after 15 seconds or so. If i do things faster, I can get to more places, because it crashes after 15 seconds, once I've chosen the server. the game no longer crashes after about 15 in Arch64 with Wine 1.1.33 (packages "bin32-wine", "bin32-wine_gecko" and "bin32-winetricks" from AUR). Thanks for the libXcursor tip, though, mouse pointer looks much better. Anyone solved this in a non-distro specific way? I compiled 1.1.32 from scratch last night and it works fine. I'm prepared to assume that Fedora's 1.1.29 still contains the crash on launch bug from 1.1.27. ExceptionRecord ModuleName="C:\Program Files\Runes of Magic\Client.exe" ExceptionCode="0xc0000005" ExceptionDescription="EXCEPTION_ACCESS_VIOLATION" ExceptionAddress="0x6bab3c"
I the game crashes at the loading screen after selecting char and entering the world. GLSL is enabled by default. And setting it to enabled specifically does nothing for me to solve the problem. RoM runes flawlessly expect for 1 small issue. The mouse won't stay in the screen correctly. While mouse looking (hold down right mouse button) once the invisible cursor goes outside of the boundary of the window, the sensitivity gets way too fast and keys will get stuck in ON mode when the mouse comes back. I noticed that the mouse look will work ok if I only move the mouse slowly, otherwise it can't keep it with the warping or whatever it is doing and it gets choppy/too sensitive. It means I have to hit all the keyboard keys to get them to reset to a off status once the mouse returns to the screen boundary. Hope this makes sense, it may be more of a wine issue then a RoM issue though. Bloom-Effects work now with the latest Nvidia Driver 185.18.14. Nice. Welcome to Runes of the Magic Bot(Rombot) free Open Beta! Welcome to Runes of the Magic Bot free Open Beta! We hope you enjoy the botting! We are awaiting your participation and thank you for your attention. Willkommen zum Runes of Magic bot zum kostenlosen Beta test (RoMbot). Wir hoffen ihr genie?t das botten. Bittet postet eure Feedbacks und Diskussionen in unserem BotsMall forum. Wir erwarten eure Teilnahme und bedanken uns für ihre Aufmerksamkeit. RE: Welcome to Runes of the Magic Bot(Rombot) free Open Beta! Yeah i will try that .. Where exactly do i enable/disable GLSL? I am using Ubuntu 9.06 64bit with latest wine. HOWTO GET AN ACCOUNT THAT WORKS! I can only speak on howto get an account in the UNITED STATES! If you are in Europe or Germany then instructions WILL DIFFER! If you use the WRONG SETUP you will have to UNINSTALL! Also, when you pick the setup, you want to pick the proper location (US not English in this case) otherwise you seem to have to reinstall. 2. Verify your created account in the email that you provided. Go to your email and click the provided link, that will send your account for processing and later on activation. 4. Log into the Frogster website. Logout if you are already logged in, and relog. This will tell you whether or not you have the correct Login/Password information. 6. Log into the website. If you are successfuly logging into the website you have created an account for the right server/Country. 7. Attempt to log into the game. If you register with the wrong Frogger site, then you will not get past Getting Server List, at least that was my problem before I found this. RE: HOWTO GET AN ACCOUNT THAT WORKS! Also, on a side note, the downloading installer does NOT work. However, the full install from a US site DOES. There is even one with a torrent download that I used myself. How are you able to install it, tadadata? The current installer aborts, and I've tried it on multiple x86-64 systems. I have changed nothing. I used a clean wine version (source code) and there was no problem to install it, in fact I tried many wine versions (ubuntu 1.0.1, source 1.1.17 and source 1.1.18) with my ubuntu 8.10 and it installs every time I tried it. I hope this will help you. Are you using the *current* installer, the only one available on their site? I have downloaded the loader from a mirror. there are 4 parts, ~ 1gb each, and a special file (400kb) called "ROMSetup.exe". By starting this file, wine was able to install the game. The notes for this app say "1. Install Wine 1.1.17", then the warning says that it will not work if you are using Wine 1.1.17 (which is true). FTR: It will also not install under Wine 1.1.18. I can install and update the game. However, when I try to start the game all I get is a scene in the woods with a river rushing by. Is there supposed to be some kind of login screen or something? It seems like people have been able to get it to work. Do I need to install something extra? By any chance are you also using a Nvidia 7xxx series? It seems to be a bug, and so far seems exclusive to that series of cards. Yes, I have an Nvidia 7950. I see your thread down below with the same issue. Has anyone added a bug report for this? Yeah, it's the bug above, bug 17818. It just got confirmed by votes so hopefully someone will take a good crack at figuring it out. as mentioned above. Check if you have "GLSL" set to disabled in your Direct3D Section. I can only speak for myself but enabling it shows the log in screen. Thank you. It's true this was the solution. My problem was that I didn't use the word "disabled" in the registry. in previous versions of wine I had GLSL set do disabled because I also played Guild Wars, and this game needed it. In Runes of Magic I saw only saw only white clouds and blue background with GLSL disabled. In later versions of wine I could see the forrest and the river but no log-in screen (as some other users are reporting, too). With the latest version of wine (1.1.25) though I also get the log-in screen but have some glitches ingame. How do I enable GLSL exactly? This bug still seems evident with ATI card..specifically 3200 HD, Arch64, Wine 1.1.29. Regardless of GLSL settings the login screen doesn't appear. I'm in a serious wtf here. I've installed RoM on 2 very similar machines. Both PCs (same intel processor and intel chipset) are running Debian Sid (both updated), gnome wm, the same winehq wine package, clean .wine. At the first pc fitted with a NVIDIA QUADRO NVS 290, RoM installs and runs flawlessly everything is perfect, gecko is installed at the beggining, the web content in launcher shows up and patching works. On the second pc fitted with a NVIDIA GEFORCE 8800 GTS, RoM installs, but when run for the first time, gecko installs but the launcher crashes as soon as web content starts to show up. Patching can only be finished if I previously download manually the patches. If I press "Start Game" before the launcer crash the game is started but crashes as soon as music gets played. I know that the menus appear to some people and to some doesn't. For me, with a Nvidia 8800GT it appeared, and now with a 7300GT it doesn't. I think it can be because of the 7xxx cards because alll the ppl i know that the windows doesn't appear have 7xxx cards. Btw, I know ppl with older cards (6xxx) and the windows appear. This does seem to be the case since I'm running a 7950 and can't seem to see the EULA, just the forest scene. Any ideas on how to fix it? Other then getting a new video card of course. And I'm not very good making patches for wine... so.... we need to wait. However I have seen others who had this problem in windows and it turns out they had corrupt fdb files... I don't know if it is related or even the same problem. But they claimed to fix the fdb files and got the logon screen to show. It isnt the problem. With my old card it worked and the files are the same. Btw i can run the game on windows with the same files. Have you tried the nvidia 180.29 drivers yet? That may be my next step. I installed them when I installed Fedora 10. Same here. All I see is the forest scene, as per the bug above. I have exactly the same problem but with a different card, an ATI Mobility Radeon HD 3400 on a Sony Vaio VGN-FW21E. So this could be a different bug, not hardware-related. It is hardware related. At the moment I know the bug appears on ALL ati cards and on 7xxx nvidia cards. I had a 7900GS replaced by a 9600GT and now it works flawlessly. I get a problem when I try to start the game (I click on START GAME in the update program), there appears a messagabox saying: DIRECT3D VERSION DOES NOT MATCH REQUIREMENTS. I click on OK. Then there is a second messagebox saying: DIRECT3D INTERFACE DOES NOT EXIST. I am using (newly installed) wine 1.1.17 and ubuntu. Then I installed DIRECTX in wine, that had no success. Before wine 1.1.17 I tried the wine version in the ubuntu reposities. With this the game startet and froze after typing account name and password, while it was submitting the data and getting the server list. Has anyone an idea to solve this problem?